The Squier Affinity Jazz Bass Guitar Pack is great all-in-one beginner's pack. With a Squier Affinity Series Jazz Bass, Fender Rumble 15 Combo bass amp, bass strap, instrument cable, a gig bag, and a pick sampler you've got everything you need to get started. Smply open the box, plug in, and rock! This super-affordable Squier Affinity Series J Bass guitar will astound you with the fabulous feel and tone of the original. Genuine rosewood fretboard, maple neck, sculpted alder body, two vintage-style single-coil J Bass pickups, and a top-loaded bridge are all the essentials you need to get it right. 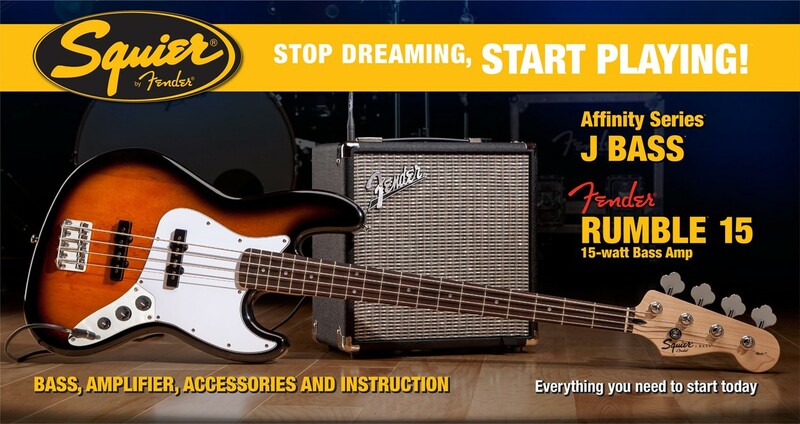 The Fender Rumble 15 Bass Combo Amp is perfect as your in-house practice bass amplifier. Fender designed the Rumble amp series for the needs of beginning bassists by building in all the essentials, then holding the line on price to make it accessible to most anyone. The ported bass design holds an 8" special driver powered by a 15W amp. Fender builds the carpeted cab of the Rumble 15 Bass Combo with oversized corners and a metal grille for durability.